For those of you who may be wondering. Yep, I'm still juicing. I'm still making green (and not so green) smoothies, as well. 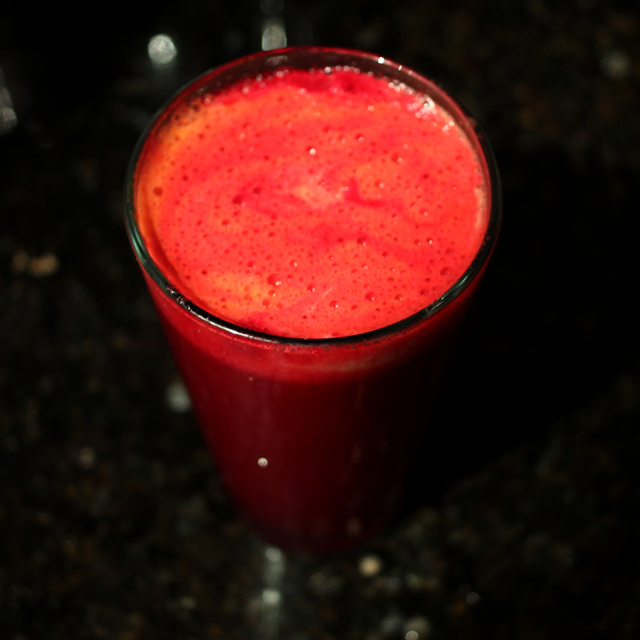 This is a pic of juice I made this morning. It consisted of one apple, two carrots, and a beet. Healthy stuff. Oh, and my super affordable Hamilton Beach Big Mouth Juice Extractor is STILL getting the job done very well. It's even cheaper now than when I bought it a year ago. Can't beat that! A woman after my own heart. That is my fav combination of juicing products. Healthy and delish! If you like avocados, this is a must try - a ripe avocado peeled and cut into peices, enough almond milk to blend to your desired consistency (about 1-2 cups per avocado), a touch of vanilla extract and a bit of honey to taste (you usually don't need much if you use sweetened almond milk.) The taste is so unique and delicious - it's a like dessert smoothie. Let me know if you try it and what you think. I have yet to try to make some juice but I definitely plan to. My mom used to make juice all the time and I used to think she was crazy for mixing some of the stuff she mixed together but it always turned out delicious. I've been meaning to start "juicing".. or just drinking more juice drinks in general, for absolutely ages!....I think I'm going to take the plunge after seeing that photo... I really don't like beetroot but it looks so pretty and yummy as a drink! Are you juicing to substitute breakfast or just to be healthy overall? That juice looks good! I love making smoothies now that I've got my ninja! Juicing was great for vitamins but not filling for me. Smoothies give me vitamins and a full tummy! I just found the same juicer on Amazon on sale! Can't wait for it to arrive. I bought 4 of them!!! LOL. For my mom, mother in law, aunt and myself, lol.